BrassCraft's 3/8 In. Female Flare (1/2 In. MIP) EFV x 1/2 In. FIP x 24 In. Safety+PLUS Gas Appliance Connector is 3/8 In. OD (1/4 In. ID) with a maximum operating capacity of 40,000 BTU's. This Safety+PLUS gas connector combines excess flow technology with the advanced corrosion resistance of ProCoat, to provide a safer gas connector for home and family. In the event of a gas line rupture or disconnect, the Safety+PLUS valve restricts gas flow at the appliance to a non-hazardous level. This immediate action helps avert the potential for a dangerous release of gas into the home. BrassCraft's stainless steel gas connector is protected with a proprietary polymer coating designed to withstand prolonged exposure to harsh household cleaning, plumbing repair and masonry products. ProCoat coating is applied to the corrugated stainless steel connector using advanced powder-coat technology. Unlike conventional dipped or sprayed coatings, the ProCoat coating is baked directly on the connector surface at high temperatures to provide a uniform coating over the entire length of the connector. The coating is applied only after the connector has been 100% leak tested, prior to nut and fitting assembly. This process results in the most complete corrosion resistance available. If you have any questions about this product by BrassCraft, contact us by completing and submitting the form below. If you are looking for a specif part number, please include it with your message. 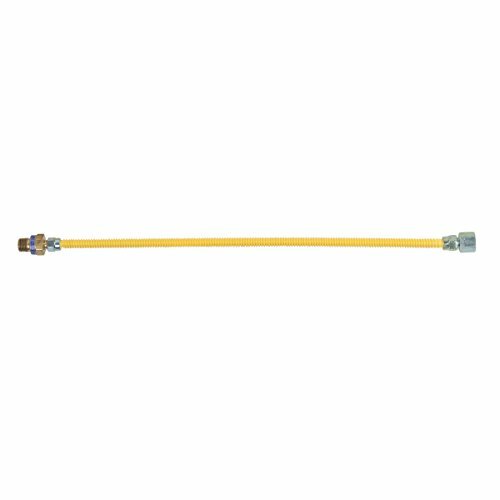 BrassCraft CSSL45R-60 P Safety PLUS Gas Appliance Connector with 3/8" OD EFV and 1/2" MIP x 1/2" FIP x 60"